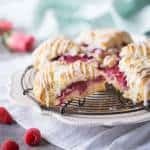 Start your day off with Raspberry Cream Scones with Rosewater Glaze! Buttery scones dotted with juicy raspberries, and drizzled with sweet rosewater glaze. Stir the powdered sugar, rosewater, and lemon juice together, cover, and set aside. Combine the first 4 (dry) ingredients in a large bowl. Cut the butter in with a pastry blender, until pea-sized pieces remain. Stir in the heavy cream just until the mixture comes together into a ball. Lightly flour the work surface and pat the dough into a rough rectangle shape, about 1/2″ thick. Scatter the surface with raspberries and fold into thirds, like a letter. Pat into a circular shape, and transfer to a parchment-lined baking sheet. Score into 6 to 8 wedges with a sharp knife or bench scraper, and bake for 12-15 minutes, or until lightly golden. Allow to cool and then drizzle with glaze.